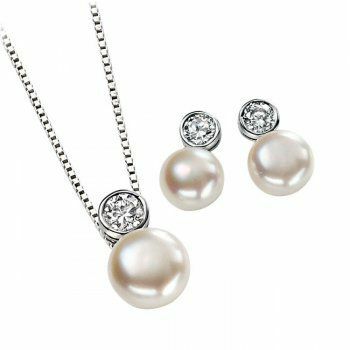 For all those who prefer to keep their jewellery simple, MAJ brings you a magical pendant and earrings Set that combines a single circular irridescent 8mm natural freshwater pearl, tipped by a simple circular sparkling 5mm cubic zirconia. The effect is utterly divine. Threaded on a 41cm *16") 925 Sterling Silver Mirror Box chain.